Actually its very easy, You don't need any software knowledge for that. Select the video uploaded by you. Find the tag section and add this tag yt3d:enable=true . Now your video is turned a 3D video, you can view in YouTube and share with others. You need 3D glasses of course. This is the easy way and you'll get 3D..and if you looking for other ways..
Look for 3D button in your YouTube Video and click for options. Select the Other options and you'll get a set of 3D options. You'll see 3 set of options. first one is 3D glass viewing that's pretty easy with 3d glasses. Second set of options for 3D monitors or TVs. Third is No 3D device. 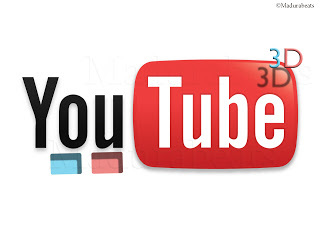 If you select the No 3D device, then you'll see 2 screens in your video. Try to see the left video with right eye and right with your left eye and this is so painful(Who is the dumb that added this feature? ).I don't recommend this.. Better see with 3D glasses.